While I was enjoying my grilled roast beef and cheese sandwich I could not help but think of other roast beef sandwiches. Although I have not been to Arby’s in a long time I still remember their roast beef sandwiches all covered in melted cheese and very often with a tangy barbecue sauce. With this idea I knew exactly what I wanted to do for my next leftover roast beef meal, a tangy bbq roast beef sandwich smothered in melted cheese. I started out by making my own bbq sauce and for the sandwich I simply warmed up and shredded some of my leftover roast beef and mixed it in with the bbq sauce and placed it on the bottom of the bun. Next came the cheese followed by a few minutes under the broiler to melt the cheese and it was done and ready to be eaten. This bbq roast beef sandwich was so good! How can you go wrong with moist, falling apart tender roast beef drenched in a tasty bbq sauce and covered in melted cheese? Mix the shredded beef and bbq sauce. Place the roast beef n your bun and top with the cheese. I am tired, I am hungry and I could totally eat this sandwich right now! It looks sooo good!!! Wow.. look at that cheese oozing out! yummy! My hubby just caught a peak of my screen and is now drooling and begging for me to make this – looks great! STOP!!! You're tempting me again! haha This looks so good! Another drooling recipe for the bistro, mmm??? You always know what I love to eat! looks scrumptious! It's good to see the days of beefy cheese aren't over yet!…. Of course we can make our own BBQ sauce. Another store bought item off the list. Your recipe will make a perfect Sunday night meal! OMG, that sandwich looks to die for! Great looking sammie, Kevin. The sauce reads like a good one, how did you like the flavor? This looks like something you would get at a really good bbq joint. Except better! I love homemade bbq sauce. Total comfort food. I'm making roast this weekend. I hope I have leftovers to try this sandwich. Looks so good! It is wrong to want one of these at 830 in the morning? I am a huge fan of Arby's beef & cheddar too. Their horsey sauce is like crack to me. We don't have an Arby's anywhere close to use, thankfully. I do have to try this one. Oh yum, that looks amazing! Especially the cheddar, hehe. This one just sucked me in … it's pretty darn amazing, Kevin! That is quite possibly the most beautiful sandwich I have ever seen in my entire life. Oh wow this sandwich looks perfect! I have a roast in the freezer and will have to do this soon! I've eaten that Arby's sandwich and I would venture to say without having even tasted it that yours far surpasses it..and I liked the original! Yours looks simply mouthwatering. 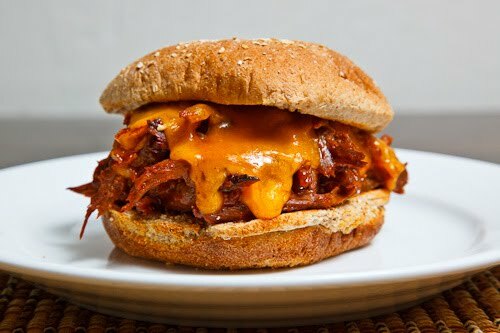 Here I am, trying to eat light for a few days (to make up for over-indulgences lately) and you post this delicious, drool-inducing BBQ sandwich. And oh, that CHEESE. Looks amazing. What a tasty treat! The picture is making my mouth water!